Mixed vegetable sambar recipe updated with video ! 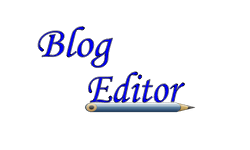 I am planning to share a collection of recipes for Indian bachelors. But before that, I wanted to share some easy one pot sambar, rasam & more kuzhambu recipes in Tamilnadu style. So I am posting this easy and quick tamil style mixed vegetable sambar recipe for bachelors, spinsters, working women and for husbands who are alone in abroad leaving your family in India . Not only for these people but also for housewives who want to finish cooking quickly during busy morning hours. Generally in Tamil nadu, Iyers & Iyengars make Kadamba sambar by adding freshly ground masala powder.They call this as Arachuvitta sambar. 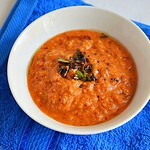 But this is a quicker version using sambar powder. 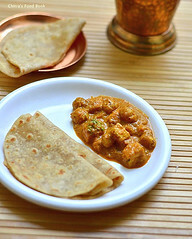 This recipe can be done under 15 minutes using a pressure cooker and a small container. Some people have the habit of cooking & storing the dal for a week in refrigerator. 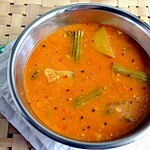 For those people,making this sambar is even more easy. I was very happy with the outcome and I had a satisfaction of eating many vegetables in one gravy. My daughter Raksha had this sambar along with vegetables without complaining anything as the veggies were cooked really soft n mushy. So this sambar is a good choice for making our kids to eat vegetables. I have used carrot,beans,brinjal & Lady’s finger along with onions. U can use a combination of Radish or drumstick, chayote/chow chow, potato and knol knol too. 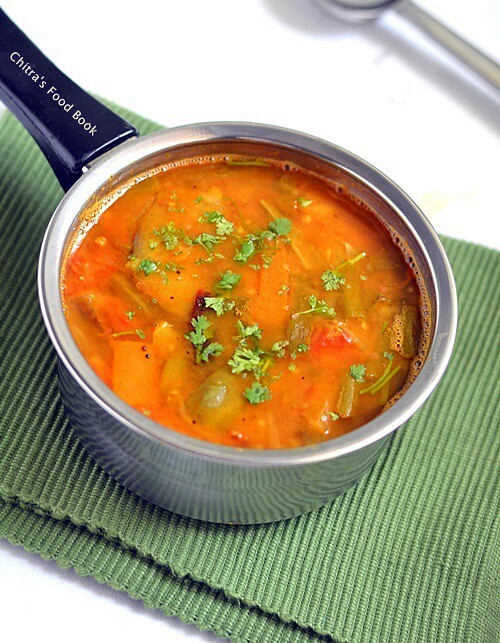 The taste & flavor of this sambar may slightly vary as per the vegetables you add but the procedure remains the same. 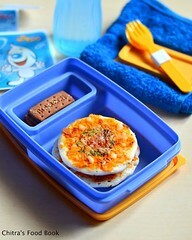 Try this quick sambar recipe for rice and pack it for your lunch box. 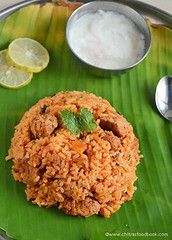 It tastes yum !Lets see how to make this easy sambar recipe for rice. 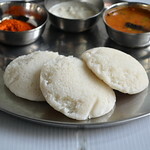 Check out my easy onion sambar & 30 kuzhambu recipes if interested. Tamilnadu style mixed vegetable sambar recipe for rice- Easy n quick version ! 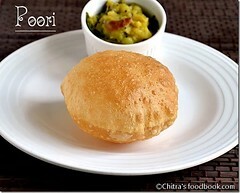 Wash and soak the toor dal in 2 cups of hot water, a pinch of turmeric powder. few curry leaves (optional) and a drop of oil till use. Soak the tamarind in 1 cup water. Wash and chop the vegetables into one inch pieces and keep them immersed in water. Cube cut onions if using big onions or just peel the sambar onions and use as whole ones. Heat oil in a pressure cooker base and splutter mustard seeds, fenugreek seeds,cumin seeds & curry leaves.Add the red chilli powder, dhania powder & turmeric powder.Saute quickly for a second in medium flame. Add all the vegetables,onions,tomato pieces & crushed garlic if using.Saute for a minute till lady’s finger shrinks a bit. If u are adding drumstick, do not cook with other vegetables. It will become mushy.So cook separately and add it. 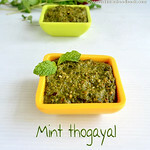 Add some raw curry leaves.Now add 1 to 1.5 cups of tamarind extract, jaggery and sambar powder. Add hing and the required salt.Add a tsp of ghee. Keep the flame very low and allow it to boil slowly. In the mean time,transfer the soaked toor dal into a small closed box along with soaked water.Make sure the size of box is double the quantity of dal else dal will spill & won’t cook properly.Keep it inside the cooker and close the lid.Increase the flame to high and as soon as the steam comes,put the weight valve and keep the flame very low.Allow it to cook in very low flame till one whistle.It takes approx. 5 minutes if using small cooker & 8 minutes for bigger one. Switch off the flame after one whistle and let the steam goes off completely.Now open the cooker and take out the box.Open and mash the dal well. Add the dal to the sambar and allow it to boil.Check for taste and add more salt and sambar powder if needed.Let the sambar roll boil in medium flame for 2 minutes.Lastly add the chopped coriander leaves and mix well.Add 2 tsp of ghee and close it with a lid till u serve.It tastes yum with hot rice and papad.Enjoy ! If u are using drumstick,do not cook with other vegetables.It will become mushy.So cook separately and add it. Cooking the dal in the box inside the cooker makes the job easy,saves time & gas.If u don’t have a small container,u should pressure cook the dal till mushy,remove in a bowl and then make the sambar in the same cooker again.U can also cook the dal the previous day night and refrigerate it.The next morning,dilute it with little water and add to the cooked veggies.Boil and serve. 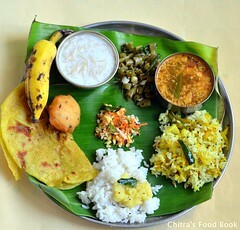 Addition of vegetables is purely your choice.U can add either one or all the vegetables. Please don’t add jaggery if u are using carrot as carrot lends mild sweetness to the sambar. Use more chilli powder or sambar powder based on your spice level. Mix this sambar in hot rice & enjoy eating with papad.It tastes divine! 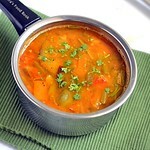 I always love mixed vegetables sambar.. it is flavourful so yum! The colors look amazing. 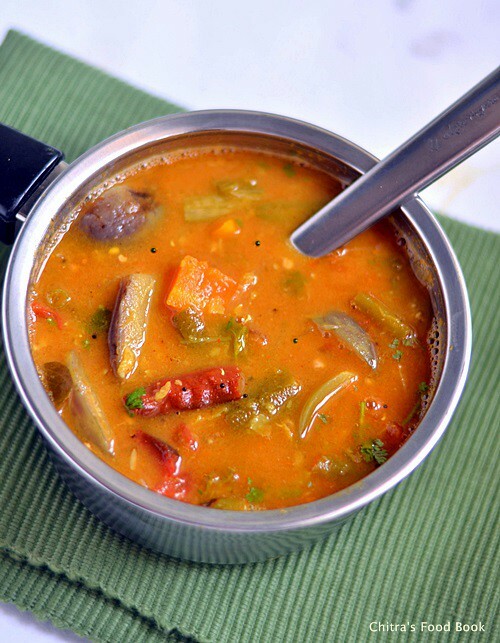 Great looking sambhar. 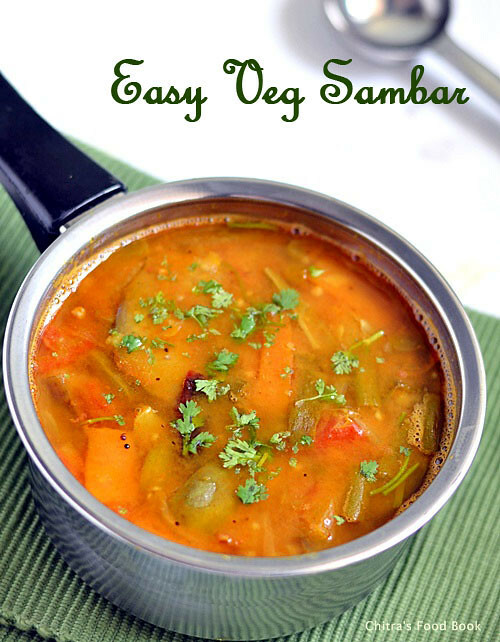 Exactly the kind of sambhar recipe beginner level cooks need!! Thanx for sharing. The sambhar looks good in the pix. One question. Why can't we just cook the Dal along with the veggies without a separate vessel in the pressure cooker? Thanks for the response. Will def try this over the weekend! !